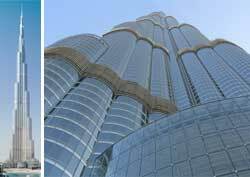 The elegant, tapering wonder in Dubai is the world's tallest building. This architectural triumph soars 822 meters (2617 feet) into the sky, 60% higher than our earth's second tallest building. There are nearly 25,000 - a window-washer's nightmare. Modern "world highest" structures have a propensity to be planned during boom years, but completed during economic downturns. This includes the Burj Khalifa (Global Recession) and Empire State Building (Great Depression). Construction began in 2004. It officially opened in 2010 with great fanfare of a light show and fireworks. The skyscraper was originally called Burj Dubai (burj means "tower" in Arabic). It was renamed to honor Sheikh Khalifa, the ruler of oil-rich Abu Dhabi. That sister emirate state helped bail out the struggling Dubai economy in 2009 with billions of dollars in financial aid. The building cost 1.5 billion US dollars to build. It is the focal point of a vast in-development office-and-residential building complex that will eventually cost 20 billion US dollars.